My wife doesn’t like my driving, and I don’t like hers. I thought that we had established this long ago and had an unspoken agreement that we would suffer our dislike for each other’s driving in silence. She had broken the code of silence. “You know we have to turn left right up there don’t you? You are not in the right lane to turn left,” she added with no sign of stopping her lane change protest. This is the point at which our marriage reality splits into two separate dimensions. There is the normal dimension, which we are all used to, where I switch back to the lane that my wife feels is more suitable for turning left. But there is also another dimension that is ruled more by thought and impulse. Every marriage has this second dimension. In the alternate marriage dimension, I continue driving in the lane I had switched into, and my wife continues to express her dissatisfaction for my lane choice. I reached over and grabbed her nose and turn it slightly to the left. This changes the channel so that her voice is suddenly turned into music, and her mouth was a speaker. I continued driving and nodding my head to the beat of Led Zeppelin’s Good Times, Bad Times emanating from my wifePod player. I reach back over and pull down slightly on her right ear, increasing the bass level of the music. Once the song ended, her voice returned and picked up right where she had left off in her protest. Without a word, I reached up to the dashboard and hit the eject button. Instantly, a panel slid open in the roof of the car, and my wife, seat and all, was rocketed skyward towards an unknown interstellar destination. Not everyone is aware of this second marriage dimension, but we all utilize it. After dinner last night, I set my plate in the sink without scraping the remaining dinner scraps into the garbage. When I turned back from the sink, I came face to face with my wife . . . the same wife who has made it abundantly clear that all food scraps are to be scraped into the garbage before dishes are set in the sink. She looked at me, and then at the plate in the sink with food on it. She frowned. Once again, reality was parted and two separate dimensions began unfolding simultaneously. In the normal reality, I quickly turned back around and grabbed my dish to scrape its contents into the garbage. But in the alternate dimension, I didn’t have time to correct my mis-step. My wife’s frown was actually a result of her charging up her plasma vaporizer weapon located just behind both of her eyes. With a strobe-like flash and whooshing sound, a beam shot from her eye sockets and struck me squarely in the chest. Instantly, the atoms that made up my body were separated from each other and scattered to the wind, leaving a pile of clothing on the floor where I had just been standing. My wife whistled cheerfully as she scraped the food from my plate into the garbage and fanned away the puff of smoke that my de-atomized body had left hanging in the air. 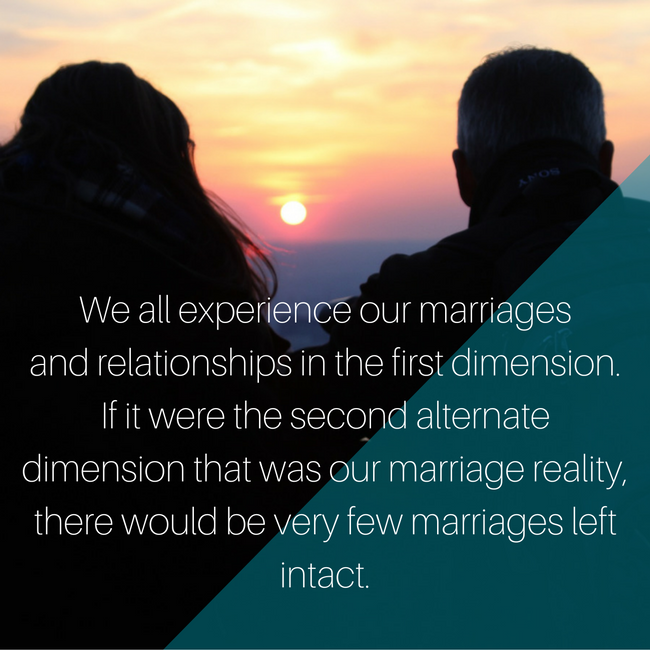 Fortunately, we all experience our marriages and relationships in the first dimension. If it were the second alternate dimension that was our marriage reality, there would be very few marriages left intact. Divorcees, widows and widowers would be the commonplace as the result of spouses being silenced, paralyzed, vaporized, flung out of moving vehicles in ejection seats, and many other forms of spousal impulse justice. In the second dimension, I never got to hear the funny comment she made about lady whose wild hair matched the hair of the dog she was walking down the sidewalk. Her mouth was loudly playing Led Zeppelin music right up until she was ejected from the vehicle. In the second dimension, my wife and I didn’t end up sitting together on the couch eating our favorite ice cream and watching an awesome movie together that evening. I had been vaporized shortly after dinner for my food covered plate transgression. In the first marriage dimension, there are second chances and I’m sorry’s. There are happy endings and long lives spent together. The next time your mind instantly transports your spouse to the epicenter of an active volcano for saying you spend too much time watching football, just remember, somewhere in another marriage dimension, you are about to spend the rest of your life alone.